The AJAX Login Modal ( ALM ) plugin extension to Popup Maker allows users to manage site login, account registration, and password recovery within a single popup. The plugin extension adds several shortcodes, triggers, and cookies to customize and manage each popup. Shortcode AJAX Login Form Add a site login form. Shortcode AJAX Registration Form Add an account registration form. Shortcode AJAX Recovery Form Add a password recovery form. Trigger Click Open integration Use existing or custom CSS selectors to display login, registration, or password recovery forms in a popup. Trigger Force Login Require login based on targeting conditions set in the Popup Settings >> Targeting box of the Popup Editor. Trigger Click Blocking Require site login based on one or more targeted CSS selectors. Cookie Login Successful Controls the repeat display of a popup after site login. Cookie Registration Successful Controls the repeat display of a popup after account registration. 1. 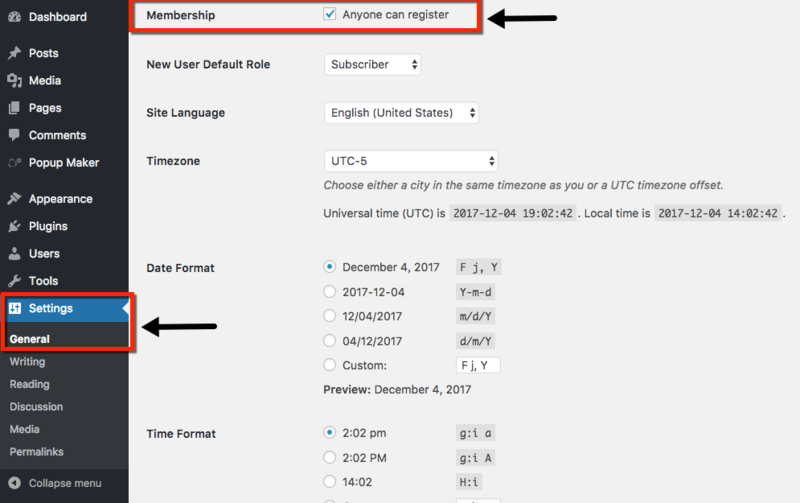 Enable the Membership option from the WordPress option settings. From the WordPress Admin, open the Settings >> General page. Locate the 'Membership' option, and select the checkbox labeled 'Anyone can register'. This allows all site visitors to register an account, login, and recover a password. 2. Add one or more shortcodes to the Popup Editor. From the WordPress Admin, select Popup Maker >> All Popups. Either create a new popup, or edit an existing one. Add one or more of the ALM shortcodes to the content editor using the Popup Maker shortcode button. Refer to the following related articles for details on the configuration of each shortcode. 3. Set one or more triggers in the Popup Settings box. In the Popup Editor, go to Popup Settings >> Triggers and set one or more triggers to display the popup. Refer to the following related article for details on trigger options. 4. Set one or more cookies in the Popup Settings box. Below the triggers settings, set one or more cookies to control the repeat display of the popup. Cookies must be linked to triggers in order to work. Refer to the following related articles for details on cookie options and configuration. The ALM plugin extension includes a hidden, preset targeting condition of 'user not logged in'. By default, ALM popups are designed to display on every page and post of a site when the conditions field on the Targeting tab is empty. Assign targeting conditions only when you wish to activate a popup on a specific page or post, or wish to use a non-content based targeting condition provided by Popup Maker's Advanced Targeting Conditions. The Click Open and Click Blocking triggers can also be used to display an ALM popup on specific links within a page. Refer to the following related articles for an introduction to popup targeting conditions and their configuration. Note: In the example video below, the site login, registration, and password recovery forms are demonstrated with the user logged out of the site. The registration and password recovery links toggle open new forms within a single login form. When logged into the site as an Administrator, the registration form link will open the WP Admin page, and the password recovery link will open the login page at '/wp-login.php'. When setting up and testing the plugin, please be aware of the plugin's behavior when an Admin user's status changes from logged out to logged in. To explore the functionality of some AJAX Login Modals, view the AJAX Login Modals Examples Page. User Menus by Jungle Plugins. Once visitors are logged into your site, customize the visibility and presentation of your site navigation with the User Menus plugin from WordPress.org. Add a login link to a site navigation menu. View the plugin landing page for further details about the plugin features. The ALM extension integrates with several other third-party WordPress plugins. The ALM popup forms rendered by shortcode are replaced by the third-party plugins, and continue to submit via AJAX.